Spring means warmer temperatures, a little bit longer days, and pastel hues. And when it comes to weddings, sometimes it’s nice to switch things up a bit. And that is exactly what this team did with this beautifully styled shoot! I love the juxtaposition of using autumn tints as unique spring wedding colors. So gorgeous, and I can’t wait for you to see! Ok, friends! Ditch the notion that spring weddings need to be pink, blue, and purple. I adore all of those colors, but when I see something different, it definitely catches my eye. Such is the case with this lovely styled shoot today. I would say that the unique spring wedding colors of green, yellow, orange and blue give a different spin on the traditional. Here are a few things I love about this styled wedding. The invitation suite, which you will see first, is gorgeous! 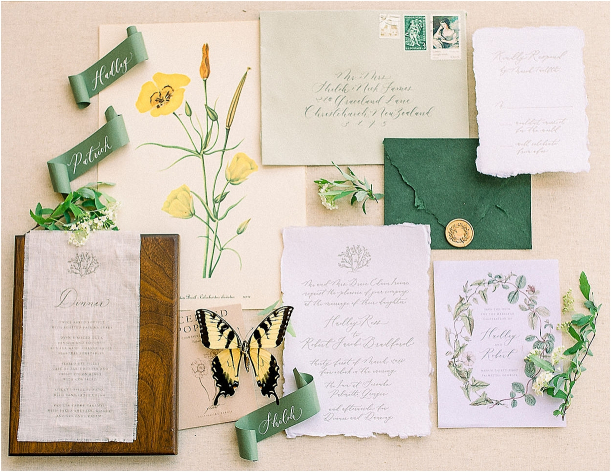 Green takes center stage and is even present in the vintage stamps. Calligraphy and a menu printed on fabric add in the most lovely details. Stunning! White on white details are subtle but ever-present in the bridal shoes, on the wedding cake, and in the wedding gown. Speaking of the gown – it is such a unique look! It is so refreshing to see something so delicate, modest, and free-flowing. Actually, the whole bridal look is gorgeous – the half up half down hairstyle and the wedding makeup add to this flawless look. The groom also looks fabulous in his blue suit with his statement watch and boutonniere. What a stunning couple! What lovely flowers! Orange, green, and white are accented with the slightest hint of blue, which is perfection. Just wait until you see the wedding cake! It’s petite yet makes a big statement with the addition of fresh, lovely florals. Be sure to notice the non-ripened strawberries on vines. Genius! Of course the setting is fabulous. The venue, gardens, and tablescape are all beautiful. I would love to just sit at that table and delight in the lovely details. 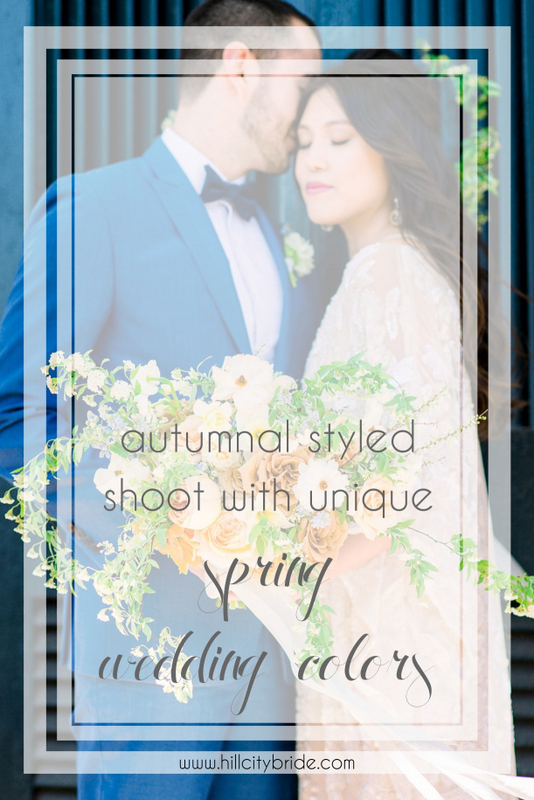 Ok, I have gushed enough, so enjoy the autumnal feel of this shoot featuring spring wedding colors you would never expect! Flowers — Cape May Flower Co.
Craving more color inspiration? Why not take a peek HERE! Liz Bayardelle - This is such a unique wedding for so many reasons! Her dress is so beautiful but isn’t one of the typical dresses you usually see, the color scheme is wonderful, and the pictures are fantastic! Kemi - That cake is so divine with the floral arrangement! Simple but beautiful. Beautiful colours and I love her dress…and the flat lays are just BEAUTIFUL!! I love them all! Steve Shakeshaft - I love the photography! 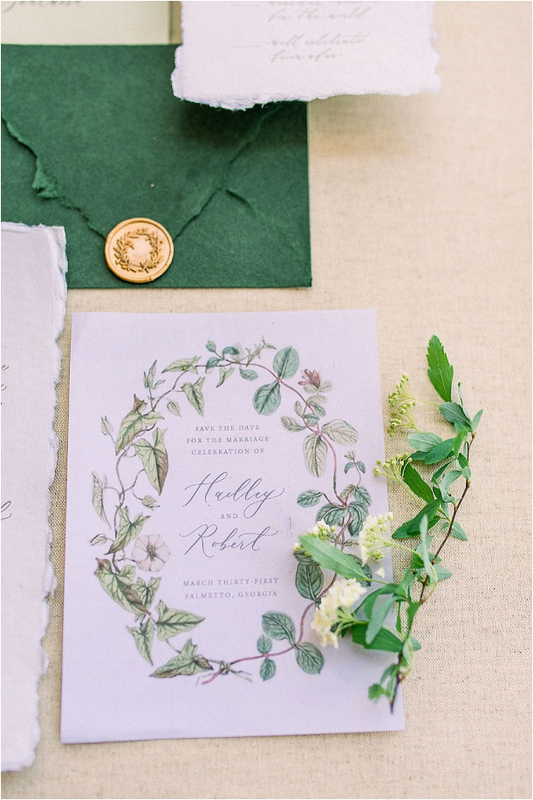 Eloise - I absolutely LOVE the Spring color wedding you’ve shown… It’s stunning! Your photos are beautiful and I would love a wedding like this some day. aisasami - Wow, this is beautiful! I have never been to a themed wedding but I love this idea. I love her bouquet! Karen Monica - I simply love every detail of this wedding. The dress, the cake and the flowers are all so beautiful.